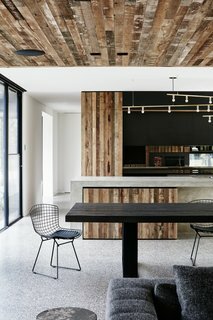 Melbourne architect and designer Travis Walton elevates a rustic retreat with a strategic combination of recycled wood, concrete, and black accents. 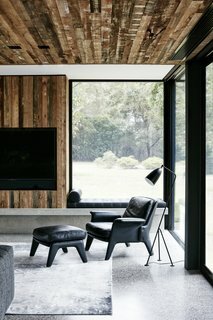 The midcentury family home is located on the Mornington Peninsula in Victoria, Australia, surrounded by native gums and banksia trees. 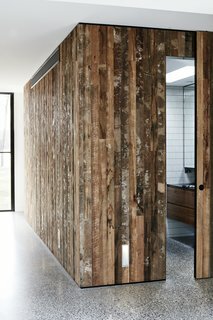 As Travis Walton of Travis Walton Architecture describes, "We drew inspiration from the abundance of natural beauty and texture in the surrounding environment, incorporating rustic finishes created by using raw and upcycled materials." 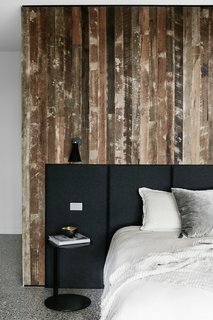 Walton employed the recycled wood as accents throughout—framing the kitchen, surrounding the fireplace, defining the ceiling over the dining area, and as a backdrop for a headboard in a bedroom. 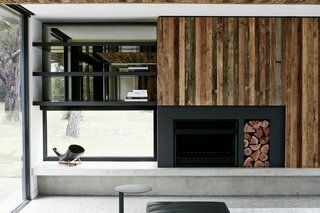 A thick concrete counter wraps the kitchen island and lines the fireplace, a soft juxtaposition to the wood cladding. 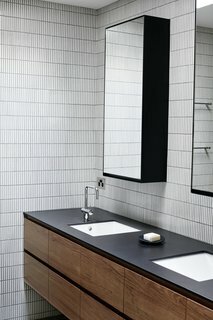 The repeated use of black accents, via window frames, kitchen cabinets, and select furnishings, add a touch of drama and sharp contrast to the natural texture. 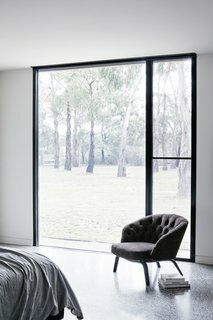 Thanks to thoughtful spatial planning and generous window glazing, the home now provides a series of spots to appreciate views of the forest, whether it's from a window seat tucked in the corner of the living room or from the bed. 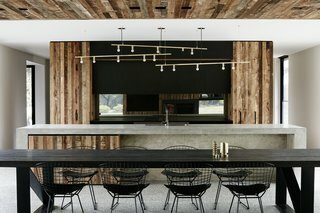 "Functionally, the end result is a house that is easy to traverse from the public to the private quarters with a strong sense of the landscape always in sight," says Walton.